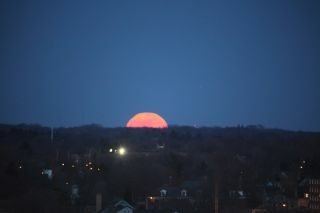 What appears to be an enormous full moon begins to rise over Grand Rapids, Michigan in this amazing photo from skywatcher Susan Wagener taken on March 19, 2011. On Saturday (May 5) at 11:35 p.m. EDT, the moon will officially turn full. And only 25 minutes later the moon will also arrive at perigee, its closest approach to Earth — a distance of 221,802 miles (356,955 kilometers) away. The effect of this coincidence is a stunning skywatching sight called the "supermoon." In fact, this month's perigee is the closest of any perigee in 2012 (they vary by about 3 percent, because the moon's orbit is not perfectly circular). The result will be a 16 percent brighter-than-average full moon accompanied by unusually high and low tides this weekend and into the new week. Every month, "spring" tides occur when the moon is full and new. The word "spring," in this case, is derived from the German springen, to "spring up," and is not — as is often mistaken — a reference to the spring season. At these times the moon and sun form a line with Earth, so their tidal effects add together. The sun, because of its distance, exerts a little less than half the tidal force of the moon. "Neap" tides, on the other hand, occur at those times when the moon is at first and last quarter and work at cross-purposes with the sun. At these times, tides are weak. Tidal force varies as the inverse cube of an object's distance. During the supermoon on Saturday, the moon will be 12.2 percent closer at perigee than it will be two weeks later at apogee, which will nearly coincide with a new moon. Therefore it will exert 42 percent more tidal force during this weekend's spring tides than during the spring tides near apogee two weeks later. And while this weekend's moon will be — as the Observer's Handbook of the Royal Astronomical Society of Canada suggests on page 101 —- the "largest full moon of 2012," the variation of the moon's distance is not readily apparent to observers viewing the moon directly. When the perigee moon lies close to the horizon it can appear absolutely enormous. That is when the famous "moon illusion" combines with reality to produce a truly stunning view. For reasons not fully understood by astronomers or psychologists, a low-hanging moon looks incredibly large when hovering near to trees, buildings and other foreground objects. The fact that the moon will be much closer than usual this weekend will only serve to amplify this strange effect. And one final note: Saturday also marks the midpoint of spring in the Northern Hemisphere. The exact moment between the March equinox and the June solstice occurs at 10:11 a.m. EDT May 5. And this spring's big full moon seemingly places an exclamation point on this seasonal benchmark. Traditionally, the full moon of May is known as the "Flower Moon" since flowers are now abundant most everywhere. It is also known as the Full Corn Planting Moon or the Milk Moon. If you snap an amazing photo of the supermoon and would like to share it with SPACE.com for a story or gallery, send photos and comments to managing editor Tariq Malik at: tmalik@space.com.